Our third production, Streamers, ran for four nights at Stevenson College, close to two thousand people attended the shows, leaving only standing room for many. Marking a major turning point for AATAT, several senior students from the UCSC Drama Department as well as incorporating from the Stevenson Theater Guild and members of the African American Theater Arts Troupe teamed up to create an outstanding production. Under the direction of Don Williams we were able to establish a greater command of the art of acting. Also for the very first time AATAT hosted a Celeste Walker's professional production by a theater troupe from Texas that presented a play called Camp Logan, which ran for two nights at Stevenson College. There was also an acting workshop set up by the African American Theater Arts Troupe utilizing this professional cast from Texas which proved to be beneficial and inspirational for the Streamers cast. The last in his Vietnam War trilogy that began with The Basic Training of Pavlo Hummel and Sticks and Bones, it focuses on the interactions and personal conflicts of a group of soldiers preparing to ship out to fight in the Southeast Asian conflict. Among them are middle class African American Roger, upper class Manhattanite Richie, who is struggling with his sexual orientation, conservativeWisconsin country boy Billy, and fearful loose cannon Carlyle, a streetwise black. In charge of their barracks are abrasive alcoholic Sgt. Cokes, who already has served overseas, and aggressive Sgt. Rooney, who is anxious to get into combat. Issues of racial tension, homophobia and the Vietnam War will be raised at UCSC from Oct. 21-24 with the controversial play called Streamers, a joint production by the African-American Theater Arts Troupe (AATAT) and Stevenson Theater Guild. The David Rabe play features an all-male cast of student actors and is directed by Don William’s, who is the founder of AATAT, a TheaterArts department lecturer, and Stevenson College preceptor. Streamers is a powerful military drama set in an army barrack in 1965, the beginning of the Vietnam War, throwing together 10 men of different cultures conditioned by society to hate and fear each other. The choice of Streamers was a difficult one for William’s and student Theater Guild producer Sol Lipman for several reasons. There are only 10 roles, none for women, graphic language and controversial themes. The flyer announcing the play runs the warning: "This production should only be view by audiences of an adult nature." Director William’s says the "shocking" and "disruptive" qualities of streamers are part of its appeal. "The writer doesn’t pull any punches. His writing cuts across the heart of various issue and at the same time shows a genuine, clear, positive relationship between blacks and whites." William’s class the plays an "actor’s showcase", meaning that sets and props are de-emphasized to intensify the confrontational dialogue between characters. Though set almost thirty years ago, Streamers is a hotbed of contemporary issues, including racism, gays in the military, and the Black male experience in America. "Streamers has a realness in it for today’s times. There is still great tension among the races that breeds from back home," William’s says. Since its creation by William’s, the AATAT has brought to UCSC a diversity of plays providing roles for Black actors that some believe the Theater Arts Board has neglected. When William’s came to UCSC six ears ago, after years of directing Black theater troupes in Michigan and at the University of Southern California, he found a definite lack of productions by and about African Americans. "I saw an opportunity to press forward," William’s says. "I didn’t see any doors open, and it took time to open those doors." It has been an eye-opening experience for many of the students involved. Eric Johnson plays Carlyle, a bisexual Watts ghetto survivor. Jackson, a senior chemistry major who has also been in other AATAT productions, says rehearsing for Streamers with the multi-race, all-male cast has been a "male-bonding" experience. "I’ve met people I wouldn’t [have] usually," he says. Jackson says he believes the importance of the African American Theater Arts Troupe lies in its mission of providing the community with a more diverse range of plays than is usually offered. AATAT’s Ceremonies of dark Old Men, he points out, was the first play to star an all-Black cat at UCSC. James Kruk, a Theater Arts Major who plays Sergeant Cokes, says he also noticed the Theater Arts Board lacks diverse offerings. Kruk says that of the eight productions he has been in at UCSC, this is the first play where he will perform with African American males in the cast. That are opportunity, says Kruk, is "one of the main reasons" he auditioned. Producer Lipman also distinguishes the all-student run Stevenson Theater Guild as independent of the Theater Arts Board. "A lot of what we’re about is taking away the pressure of having to go through the Board to put on a play," says Lipman. The cooperation between a diverse group of people has been a fulfilling experience for everyone involved. Lipman says, "We’ve built a real community of people here." What’s that I hear? Are those the sounds of ROTC being drilled on our campus? No, that’s just the cast of Streamers, working hard. If you missed these well-trained soldiers marching across the university or the staff, you missed a top-notch production put on by an electric but cohesive group of actors. The Stevenson Theater Guild joined together with the African-American Theater Troupe (or in this case is that "troop?") 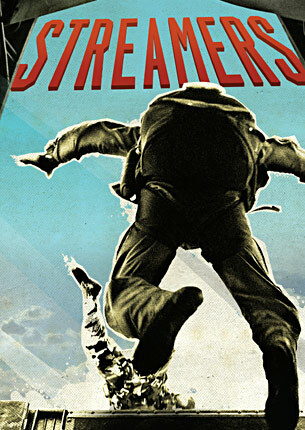 from Oct. 21 to 24 to present David Rabe’s Streamers, directed by Don William’s. Streamers deals with four soldiers about to be shipped off to Vietnam and the fears, friendships and self-realizations they experience. Although the play is set in 1965, the problems of coping with homosexuality, racial tension, and other issues in the military are still very applicable in the present day. In it’s exploration of the fears and insecurities of these four soldiers, David Rabe employs a kind of violence and frank language not present in many works. It is this forthrightness which shocks the audience, immediately drawing them into the lives of these characters. The humorous banter among the soldiers and their sergeants made the moments of tension even more poignant. The different reactions of the characters to the issue of homosexuality was an insightful look at a controversial issue which still troubles our society, especially after President Clintons’ revival of it when he took office. The three methods of dealing with the homosexual issue-complete acceptance of homosexuality, homophobia, and trying and ignore the issue-were embodied in the three main characters of Streamers. The script contains many difficult and violent scenes, which the actions succeeded-despite having only four weeks of rehearsal time-in performing so that the audience felt scared angry and uneasy right along with the characters. The technical aspects of the performance as well were detailed and convincing in these troubling scenes. The talented cast included Justin Carella as Martin, Evrett Kramer as Richie, Eric Jackson as Carlyle, Lance Windish as Billy, Joshua Bee Gram and Blake Riggs (understudy) as roger, Jamer Kruk as Cokes, Mark Bentkauer as Rooney, Eyal Alon as an M.P. Lieutenant, Blake Riggs as PFC Hinson, Dewey Wong as PFC Clark and Barry Zink as an M.P. On the diversity of backgrounds in the cast, Dewey Wong said, "Streamers gave a context where people who may not have come together on a common piece of theater,"
"Theater to me is such a wonderful release from all the tension of school," said Eric Jackson, a chemistry major. This mixture of students proved beneficial to those involved exclusively in theater as well. "It exhilarates me to watch the actors who have never performed before, as they realize that theater is for everybody, and how incredible it feels to be able to be anyone," said Jamer Kruk, a senior theater arts major. As both theater and food for thought, Streamers was an enriching experience both for the actors involved and its audiences. Look for don William’s next Production. Jo Turner’s Came and Gone, in February - considering how well Streamers went, I’m sure it will provide to be well worth your while.